Julie Felix was born in Santa Barbara, California on June 14th, 1938 into a spiritual background of mixed cultures. Her father was Mexican and her mother an American of Welsh ancestry, but both had American Indian blood in their veins which Julie feels deeply connected to. "The American Indian which I get through my mother and my father. This wonderful connection to the land." Her father, "an excellent musician", taught her how to play guitar, and at the age of seven she wrote her first song which she says was "about a pixie." In her early twenties while working as a sports mistress at a school for mentally backward children she began a career in folk music, following in the liberal traditions of Pete Seeger and Tom Paxton rather than being part of the radical left. Her passion for folk songs had begun in her childhood through her father's mexican guitar playing and her mother's Burl Ives records. Her own music was very commercial for a folk singer and led to her becomming an early champion of the singer/songwriter movement. "I grew up listening to my father singing Mexican songs. I was helping someone run for office in High School and I wrote a song - Betsy Robert For Queen Of The Girls' League. It didn't work out on the ukulele so I asked my father if I could use his guitar. Soon I started singing in coffee houses in Santa Barbara. A little guy used to come to those clubs. He was always asking me about guitar chords. He used to get on my nerves. His name was David Crosby." In the early sixties at a time when many folk singers such as Paul Simon and Jackson C. Frank were re-locating, she left her home in California inspired by Jack Kerouac's book "On The Road" and hitched around Europe. "The feeling generated by that book was very much in the air, many people from my generation wanted to get out there and really experience life. Kerouac and the existentialist writers like Camus were an inspiration, although I still don't know what 'existentialist' really means! We wanted to know what it felt like to be hungry and out in the rain, meeting life head on." She had originally intended only to holiday on a Greek island in the Aegean with 1000 dollars that she had saved up, but after singing in local coffee bars for 30s. per night she managed to save up enough to hitch through Italy and France before heading for the Mediterranean island of Ibiza where she sang for six months. After spending time in Germany she finally settled in England in September 1964 and made her home there. "I took off for Greece in June 62, supposedly for three months, but I never went home, I came to Britain via France, Italy and Spain, singing in folk clubs and even army bases... I love the climate in California, but I hate Los Angeles. I still have a US passport as well as a UK one, which means I can miss the queues at both ends! What I like about Europe is that you can just pop over to Holland or Spain and there's so much diversity and cultural richness and everywhere is so close. Britain is great because, despite the fact that we supported Bush during the Iraqi conflict, which I strongly disapproved of, we could still obtain independent information in this country. That just doesn't happen in the States. What Bush says is seen as more or less gospel." She signed a record deal with Decca, making her the first solo folk artist to be singed to a major British label, and was procalimed "Britain's Leading Lady of Folk". Her first album "Julie Felix" and her first single "Someday Soon" were released, but her appeal was truly realised by the British public when she appeared on The Eammon Andrews TV show and had to return the following week to appear again by popular demand. Thankfully television had furthered a career which was hampered by an industry with no experiance of her sort of entertainer. "This was the first time that Troubadours had been in the hit parade and my agent didn't know what to do with me and so put me on a show called the Hootenanny Show." She was a very strong willed young lady who fought fiercely throughout her life to promote causes she felt to be important, using her musical career as a way of doing this. "As a musician, I felt kind of like a troubadour - someone to spread the news. I feel all artists have the ability, if not the responsibility, to spotlight certain areas in our cultures that need balancing." During a tour of Kenya and Uganda in Africa she worked for both the charities Christian Aid and Freedom From Hunger. Years later she performed to promote Women's Rights and made appearances at Environmental Benefits. Her private life was not as well publicised as her charity work which worked greatly in her favour. Whilst living and working in London she met fellow singer/songwriter Paul McCartney and began seeing him regularly in secret. As far as the great British public, and indeed the world, were concerned Paul was going steady with actress Jane Asher and any other girls he was seen around with were merely aquaintances. Julie lived her private life in a very sixties way, even becomiing before-her-time when she gave birth to a daughter and raised her as a single parent before it was the done thing. "I think we had different relationships in the Sixties: I had a rather Sixties arrangement with Leonard Cohen, who never wanted children. For various reasons, we didn�t have contact with [my daughter's] father - we don�t talk to anyone about him - and I feel guilty about that." As her daughter recalls, "She was a longtime girlfriend of David Frost and she dated Paul McCartney, who played her Strawberry Fields before it was published. But she was so worried about being thought of as a "cool, hip chick" that she didn�t dare say anything to him... I prefer not to talk about my dad, but I think Mum tended to go for strong, bossy boyfriends because, even though she was this beautiful, famous person. she wasn�t in control. In 1965 her live career took off when she headlined at Croydon's Fairfield Hall, and performed her first solo concert which made her the first British-based folk singer to fill the Royal Albert HaIl. By 1966 she was appearing weekly on a TV show called The Frost Report and was such a successful TV personality that in 1968 she was given her own series of seventeen shows on BBC2, Once More With Felix which was the first colour series produced by the BBC, went on to be sold to virtually every country in the world, and eventually moved to the main British channel BBC1 due to it's huge success status. The series ran for two years until she started work on another TV series named The Julie Felix Show. Her new-found fame confused her at first, "I never realised how many people were watching. After a while the recognition got to me. I had a place with a high fence and used to hide when the doorbell rang. It's great being famous but there's a guilt that you don't deserve it or aren't good enough. I know a lot of people who have this. Yes, we are all here to learn lessons and to cope with our insecurities. We all have a special gift of some sort and should learn how to use it." Julie saw her gift as being able to convey important issues within the medium of music, and made sure that her muic was always taken seriously. "As soon as you use your face and name to promote toothpaste, or whatever, people don't trust your opinions on anything ever again!" In 1971 her campaigning continued when she sang to a record breaking 27,000 people at New Zealand's Western Springs in order to urge the Kiwis not to engage in conscription for the Vietnam war. On December 19th of that year she gave birth in London to her first child, a daughter named Tanit Alexandra Teresa Guadalupe whom she brought up as a single parent long before the idea bcame socially acceptable. "I didn�t tell my mother I was pregnant, and she hasn�t forgiven me for that. I called her up after Tanit was born on December 18, and told her she had her first granddaughter." During the late seventies she moved to Norway where she gained a number one single with the title track of her album Hot Chocolate. She recorded two successful albums there but by the 1980s she was feeling disenchanted with the way her career was going and returned to live in her birthplace of California where she took a break from the music world to study healing, meditation and Yoga. "Everyone wanted me just to sing the old songs and that along with the fact that my audiences were getting less, I wasn't selling as many albums, and Bob Dylan says 'There is no success like failure and failure ain't no success at all.' Still it does get to you and I got into what I call the Aquarian arts. I started off with Yoga then I got into meditation, astrology, healing and that sort of saw me through. A sort of a spiritual base. That was an incredible blessing. Because although I felt incredibly lost and I felt I needed that spiritual support, at the end of the day it's what re-inspired me because I'd lost my inspiration. On a personal level I was going through a Pluto transit which is an astrological thing of an identity crisis. But I think this feeling that all our dreams of the sixties had meant nothing because in came Reagan and Thatcher... It was a difficult time for me. I think it was because I had always been protesting against people with money and power, and then I became one of those people." It was a peace march through America in the late 1980s which brought her back to jusic. During the dangrous march she witnessed the suffering of the indigenous peoples of Latin America and made the decision to return to her home in Hertfordshire, England where she began singing for Latin American refugees, peace projects relating to the Gulf war and for women's and gay rights. "It was very difficult transition for folksingers to be thrown into the mainstream in the sixties and when the spotlight moved on and we wondering what we were supposed to do. I stopped for four years in the eighties. When I came back in it was after I went on a peace march in Central America. I think it was tuning into a spirit of things." Her first album for ten years was finally released on the Remarkable Records label which she had also put considerable effort into creating. During that busy era she also found time to found Britain's first New Age Folk Club, The Magic Messenger which did great things for budding poets and musicians. The spiritual time she had spent back in California still had a major effect on the way she led her life, so in the 1990s she set up another company called Goddess Tours which arranged pilgramages to sacred sites throughout Europe and the American Southwest. "When I'm not singing I often take groups of women to sacred sites. That has a lot to do with when the diety, when God was the Goddess and the earth was the body of the Goddess... When I take these tours they are women who are unitarian. They belong to Christian churches but they do courses called 'Wise Up and Call Her Name' and look up all the female dieties. In India, they have Cali, Shakti there is a wonderful choice of dieties rather than just one. Many women feel out of the loop because of the maleness of the divinity, so we travel together to sacred sites which were shrines to goddesses, like stone circles, holy wells. standing stones and that connects us to the divinity of the Earth itself. We need to respect her to revere her because we have wounded her very I greatly. The tours have taken me down a path of discovery that has really reinspired my feminism in an inner rather than political way." Julie had always felt deeply about the effect of military agression in Third World countries, but when she saw pictures of HRH Princess Diana in Angola's minefields she was deeply moved and added campaigns against landmines to her long list of causes she had a passion for. "The more I discovered, the more dedicated I became. It put in focus a great waste of life. These minefields remain long after the wars are over. Countries most affected are the poorest and, within them, the poorest sections of communities are affected. These mines are a great scar on the conscience of the world, and we are allowing it to continue." 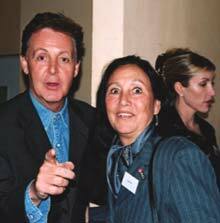 She works closely with Adopt A Minefield whose patrons are her ex-beau Paul McCartney and his wife Heather, works with her longtime friend and legendary ex-Zeppelin guiarist John Paul Jones for the Mines Advisory Group, and hosted a Guitars Against Landmines concert in Manchester during January 2002. Her private life centers around her home in Chorleywood, Hertfordshire where she lives with her daughter and her daughter's boyfriend. Tanit sees them as having reversed roles within the family. "Now we have a weird co-dependency: I�m a counselor, my mum is the performer. I am the nurturer who runs the home, which allows her, the musician, to go off, and then I�m here for her to come home to. I love being here in our home - my partner, who runs a garden design business, lives with us. Today our roles are reversed, and we say we�re a bit like Saffy and Edina in Ab Fab. I�m the housewife who cleans up after my mum - who comes in after her gigs and causes so much chaos, I�ll say, 'Clear this up!' and 'You�re going to be late!' When you�re a star you don't realise you�re the one who should be buying more washing-up liquid, because someone does it all for you. And fair enough. But I feel I�m talking to her with this constant nagging voice. I�m much more traditionally� feminine than my mum: I�m always cleaning, but she just doesn�t notice. She�s really a tomboy at heart and she doesn�t care about clothes, whereas I�ve always been into make up and all that kind of stuff. I look at Mum, thinking: 'Why don�t you do that with your hair?' Meanwhile, she just throws on her favourite old jeans and trainers." You that build the bombs. You that hide behind walls, You that hide behind desks. "When you dream a dream alone, it is a dream. When you dream a dream together, it is reality." Yoko Ono. SOURCES: various books and magazines about the 1960s music scene, interviews in various publications and Julie's Official Website.